Let's say that on Tuesday, Microsoft closes at $26.57. After the close they come out with their earnings report. They report higher than expect earnings that causes excitement among investors. Buy orders come flooding in. The next day Microsoft opens at $27.60. Since there were no trades between $26.57 and $27.60 this will create a gap on the chart. You can see on the chart above that the stock closed at one price and then the next day the stock "gapped up" creating a price void on the chart (yellow circle). Sometimes you will hear traders say that a stock is "filling a gap" or they might say that a stock has "a gap to fill". Are you wondering what the heck they are talking about? 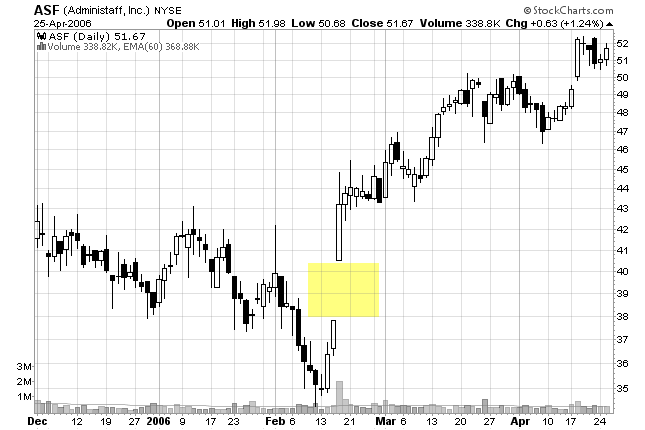 In Japanese Candlestick Charting gaps are referred to as windows. When we say that a stock is "filling a gap", the Japanese would say that the stock is "closing the window". 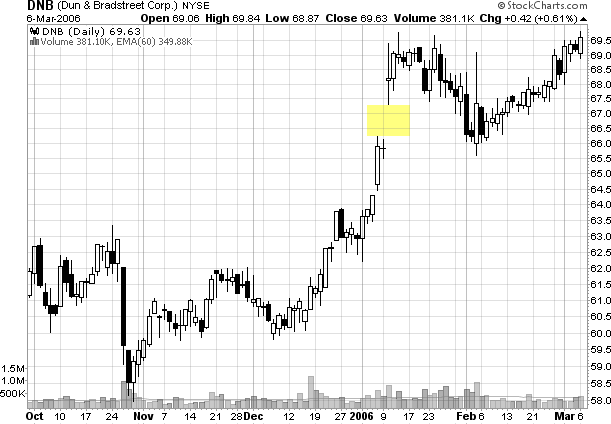 In this example, you can see that the stock gapped down. A few days later it rallied back up and filled in the price level at which there were previously no trades. This is known as filling the gap. Sometimes you will hear traders saying that "gaps always get filled". This just simply isn't true. Some gaps never get filled, and sometimes it can take years to fill a gap. So I really don't even think it is worth debating because it offer no edge one way or another! Was this gap caused by the amateur traders buying or selling based on emotion? To figure this out you have to understand this one important concept first. Professional traders buy after a wave of selling has occurred. They sell after a wave of buying has occurred. Amateur traders do the exact opposite! They see a stock advancing in price and are afraid that they will miss out on the move, so they pile in - just when the pro's are getting ready to sell. 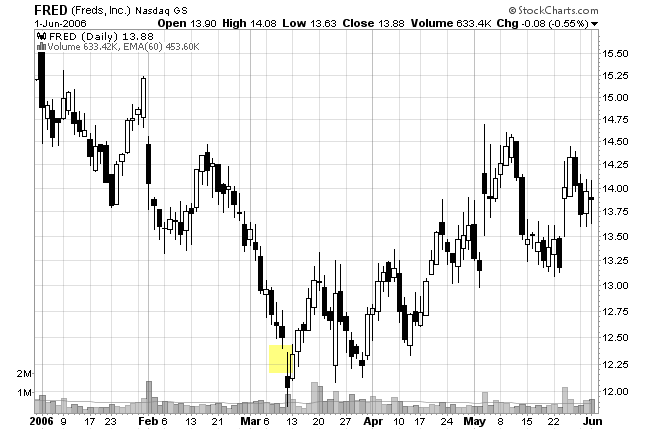 See how this stock gapped up after a wave of buying occurred? These amateur traders got emotionally involved in the stock. They piled in after an already extended move to the upside. These traders eventually lost money as the stock sold off over the next few weeks. Notice how the stock eventually did go back up - but only after a wave of selling occurred (professional buying). See how this stock gapped down after a wave of selling occurred? These amateur traders got emotionally involved in the stock. They sold after an already extended move to the downside. Ok, so let's break this down, shall we? If a stock gaps up after a wave of buying has already occurred, these are amateurs buying the stock - look to short. If a stock gaps down after a wave of selling has already occurred, these are amateurs selling the stock - look to go long. 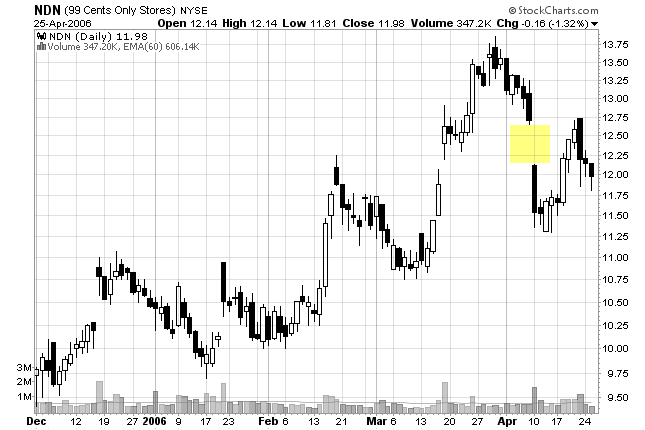 These types of gap plays usually provide great opportunities because they represent and extreme price move. Well, there you have it...a short primer on trading gaps. ...something every trader should strive for.